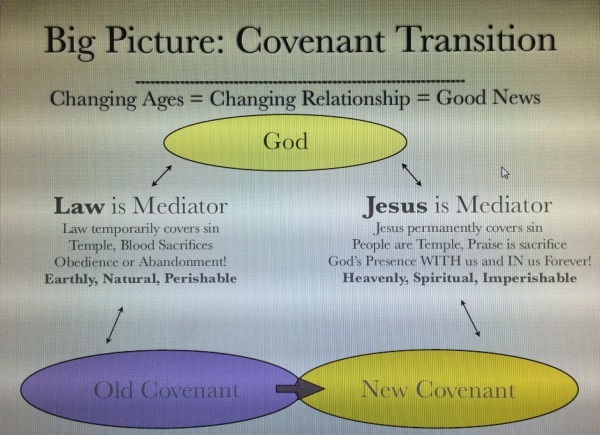 The relational concept of "covenant" develops from God's dealing with individuals such as Abraham, Isaac, and Jacob, to be realized in community. Adam was the corporate "head" (representative) of people determined by covenant. Israel was the corporate representation as defined by the covenant. Christ was the corporate "head" (representative) of people determined by covenant. From first to last and beginning to end, the importance of God working through HIS community must not be underestimated. "But we all, with unveiled face, beholding as in a mirror the glory of the Lord, are being transformed into the same image from glory to glory, just as from the Lord, the Spirit" (II Cor. 3:18). 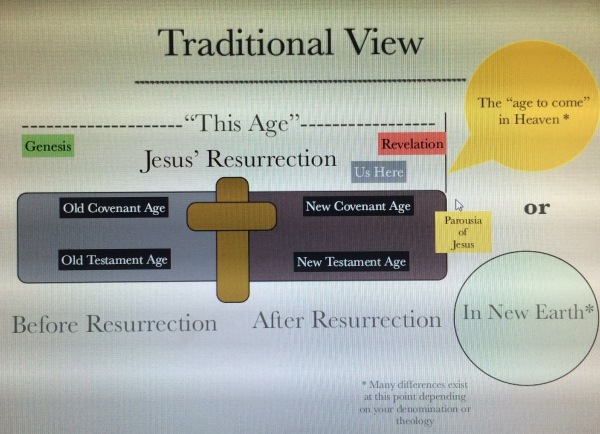 "The passage from the Old Testament to the New Testament occurred through the death and resurrection of Christ, not instantaneously, but by means of a transformation that was accomplished through the "body of Christ". 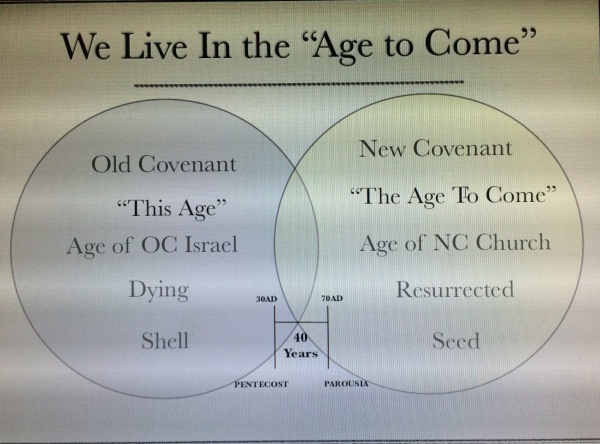 It is important to see the real connection between the two covenants and the role of the early Christian community, under the pre-parousia reign of Christ, in bringing about the transition from the Old to the New. 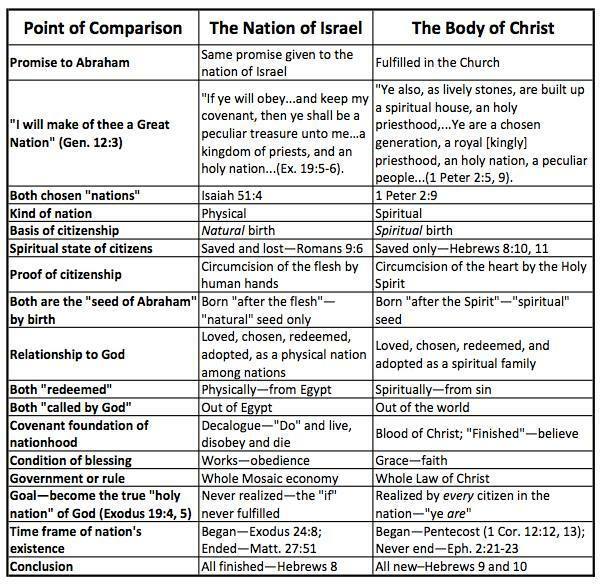 The design of Christ's death and resurrection was not the termination (annihilation) of the people of the Old Testament, but their rebirth as the Israel of God according to the Spirit. Paul is greatly misunderstood when his law-free gospel is interpreted as a complete break between the two peoples of the two covenants. Paul never presented the church as the displacement of historical Israel. The new creation in Christ was, in the understanding of Paul, the transforming consummation of the Old Testament economy. 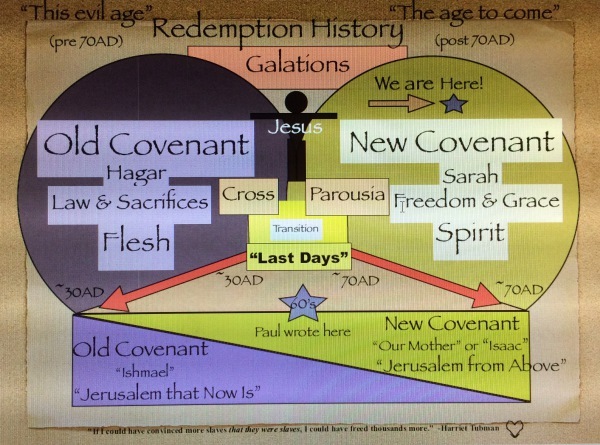 The events taking place with the "remnant" as "firstfruits" of the approaching "harvest" (Matt. 13:39; Rev. 14:1-20) the 40-years of transition were never again to be repeated in the lives of believers living beyond that time. The "everlasting gospel" (Rev. 14:6) was the line of demarcation for the arrival of the "hour of His judgment" (Rev. 14:7) and the time of the settling of accounts had arrived for the "wrath of God" to be poured out (Rev. 14:8, 10, 19) upon unbelieving Israel and the entering into the promised "rest" for believing Israel in her rebirth. While some insist on the church as something different and distinct, even a displacement of historical Israel, God's "purpose of the ages" (Eph. 3:11) in Scripture teaches NO such thing. 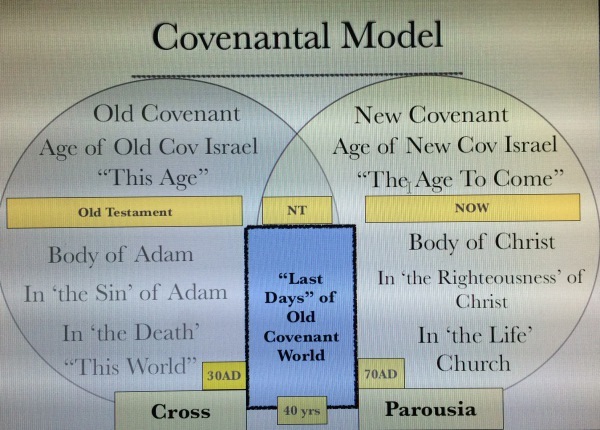 The church as the "remnant" takes up the "promises made to the fathers" (Rom. 15:8) and embraces Messiah as His corporate "body" in looking toward the fulfillment of the "hope of Israel" (Acts 28:20) in the resurrection of the dead. The mission of the corporate community during the "last days" was that of gathering Jew/Gentile together into the "one body" (I Cor. 12:13; Eph. 4:4). In the resurrection motif, the apostle Paul demonstrates the unity of God's purpose through the believer's participation with Christ by their "death" to the Old Covenant (Rom. 7:1-4), and their subsequent resurrection as the "new creation" (II Cor. 5:17). As the corporate "head" (representative) when Christ "that one died for all, therefore all died" (II Cor. 5:14; Rom. 6:3-5). God had "a plan for the fullness of time, to unite all things in him, things in heaven and things on earth" (Eph. 1:10 ESV). 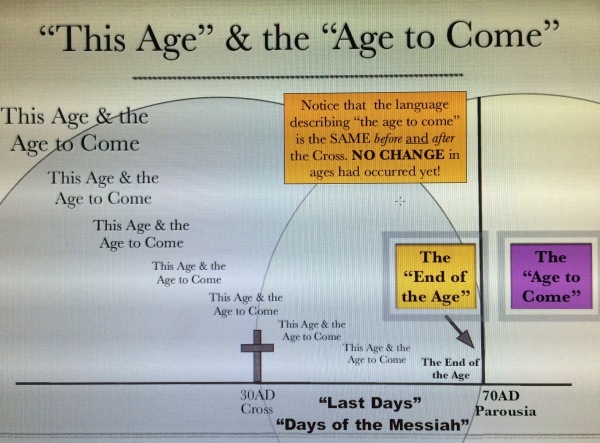 When the "last days" ended in 70 CE, so also did the "fullness of time" for the completion of redemptive history. It is amazing to read and to know the covenant faithfulness of God in keeping all of His promises and fulfilling all of His Word. There is so much more to learn and to empower us living today to BE the victorious people He designed us to be. In the near future, much of the work of Fulfilled Dynamics will begin to bring the pieces and clues found in the Scriptures, from Genesis to Revelation into their proper perspective. Study along with us! "The New Testament Church is Compared to Israel in the Wilderness". 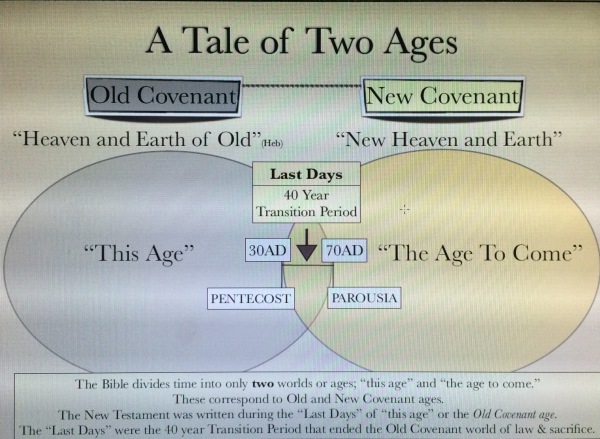 This is an excellent ongoing article (9 parts thus far) by Joe Daniels and Terry Cropper, and is published in The Fullfilled Covenant Magizine (online). Both have "author" pages on the site with their respective articles. "The Significance of the Number 40"
Todd Dennis and Richard Anthony point out the significance of the number 40 in Scripture, specifically in regard to the often overlooked "Transition Period" and it's typological significance. The parallels are quite remarkable. The website is located at http://www.ecclesia.org/truth/.